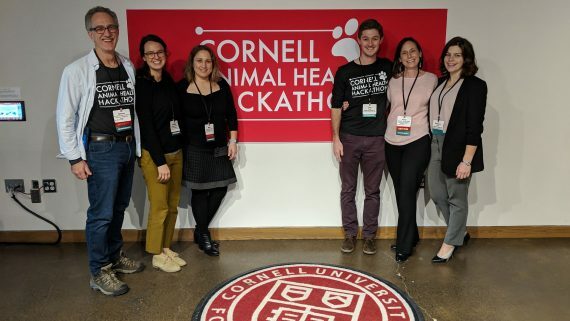 Trey Cook, class of 2021, speaks to the audience at the recent 2019 Animal Hackathon at Cornell University. FarmSpeak is a simple idea that’s simply brilliant. The phone app helps crumble communication barriers between farmers, their non-English speaking employees and the veterinarians who work with them both. And it all came together in 20 hours. 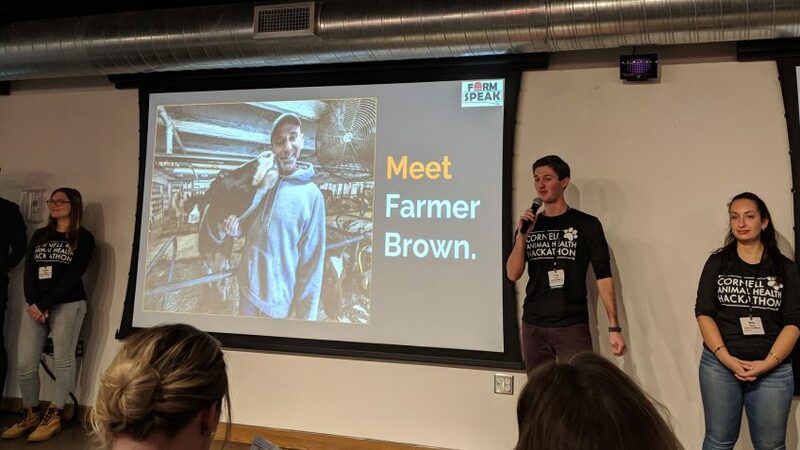 Trey Cook, a second-year NC State College of Veterinary Medicine student, and a team of former strangers created FarmSpeak at the recent 2019 Animal Hackathon at Cornell University. For the third year, students across the country came up with solutions to veterinary health care needs and presented product pitches both ingenious and practical. Cook was the only veterinary student on his team. That was part of the point. The Animal Health Hackathon joins students from disciplines who typically never interact but have a lot to gain from each other. There are typically MBAs and business undergraduates, biophysics majors and chemical and biomedical engineers, all there to solve pressing veterinary issues. The result? Cook’s knowledge about the relationships between farmers, their employees and large animal veterinarians — and the potential medical dangers that can result from language barriers on a farm — were blended with the technical know-how of his engineer and marketing teammates. Using pictures and easily translatable words and phrases, non-English speaking farmhands can note any irregularities they see with a farm animal — in this prototype, the team used cows and the Spanish language — on scannable sheets of paper coated in low-density polyethylene plastic. A farm downloads the booklet of information to a phone app that translates the notes. That information can then be shared quickly to the veterinarian. Cook’s team won best market-ready product. It is the first year the NC State CVM sent students and faculty advisers to the event. The inaugural NC State Animal Health Hackathon is tentatively scheduled for Sept. 27-29 at the CVM. “I think it’s particularly important for veterinarians to see themselves as collaborators and problem solvers, to see themselves as individuals who can bring value and useful perspectives to entrepreneurial and interdisciplinary work.” ~ Laura Nelson, CVM associate dean and director of academic affairs. Cook grew up in the Charlotte suburbs and had barely spent any time on a farm before coming to the CVM. Now, he said, he feels most at home in the barns of the school’s Teaching Animal Unit. With FarmSpeak, Cook was able to focus on a problem he has seen for years during his CVM education, particularly in the North Carolina swine and poultry industries. The CVM’s curriculum not only recognizes the benefit of cross-disciplinary collaboration but emphasizes its necessity. The college integrates three semesters of communication training over three years for DVM students, classes and hands-on experiences that help develop effective collaborative techniques. Business classes at the CVM give DVM students information on the economic ins and outs of running their own practice, but also incorporate a project where a student team presents a business proposal for a product or service that fits the needs of veterinary clients. The NC State Veterinary Medicine Hackathon team included Simon Roe, professor of orthopedics, Elisa Crisci, assistant professor of virology, Caroline Schlaeppi Fisher, class of 2021, Trey Cook, class of 2021, Amy Snyder, clinical assistant professor and Rebecca Jones, class of 2021. Amy Snyder, a CVM clinical assistant professor who started in general veterinary practice before earning an MBA, leads the college’s business classes and was a mentor to the Hackathon teams. 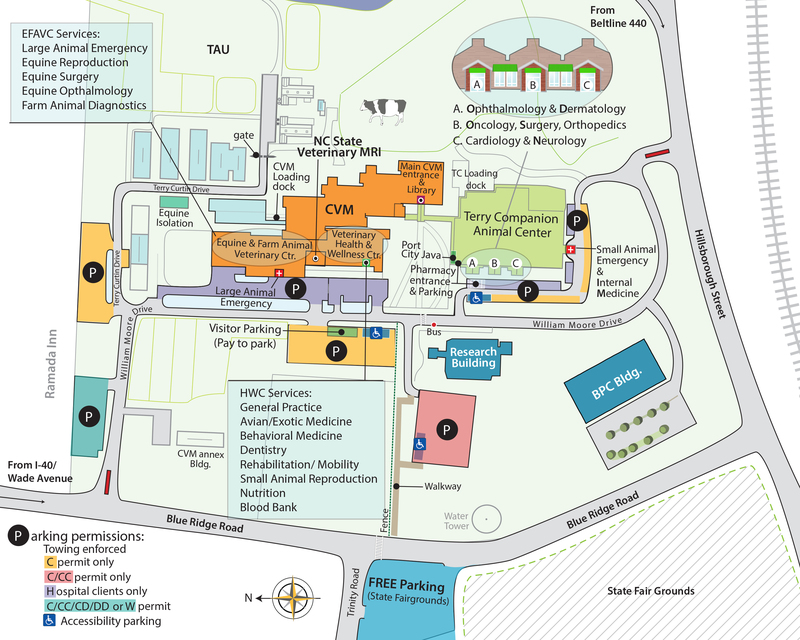 Snyder can envision a CVM-hosted Hackathon that includes veterinary students paired with those representing the rich array of fields at NC State and the Research Triangle. “Sometimes when it’s just us trying to solve a problem, we can get mired in our own minds and we can’t think outside the box,” said Snyder, who has been a strong proponent of bringing a Hackathon to the CVM. “When you talk to somebody else who thinks in a different way, that’s when you get real solutions. At the Hackathon, she discovered that entrepreneurship isn’t always just about finding that light-bulb moment. “Hackathon felt like an incredibly long anatomy lab where you know the knowledge you’re looking for is somewhere in the room and together you can find it,” Jones said. Cook’s team may work together to actually market the FarmSpeak app. Something more definite is his goal of working in a large or mixed animal practice, probably in a rural setting. “There’s people, groups all over the world, who live and die based on what their animals do. They can send their kids to school is they have good milk production that year,” said Cook. “The difference between having enough to eat and starving is if they had a calf that year. And perhaps find time for a bit of veterinary entrepreneurship.